Here are the books I got in the last two weeks! I also put in my word regarding the latest IMM drama. Hounded by Kevin Hearne [ Amazon | Kindle | Book Depository ] Thank you Del Rey! The Sweet Scent of Blood by Suzanne McLeod [ Amazon | Book Depository ] Thank you Penguin! The Iron Witch by Karen Mahoney [ Amazon | Book Depository ] Thank you Flux! Th3 Cha0s by Rachel Ward [ Amazon | Book Depository ] Thank you Big Honcho Media! Clarity by Kim Harrington [ Amazon | Book Depository ] Thank you Big Honcho Media! I really like your blog and it's an awesome pile of books you got in your mailbox. Great mailbox! Hounded has a fantastic cover and wow, that has to be the fastest releasing series ever, haha. Looking forward to your thoughts on it! The Iron Witch looks so good too. I hope you enjoy your books! Great IMM Tynga!!! I have the Iron Witch too and I cannot wait to read it!!! I am really looking forward to Paranormal Spring break yayy!!! Two more weeks! Great haul! I got The Iron Witch this week too! Happy reading! Great loot Tynga. This was the first time I have watched one of your vlogs and had to smile at your accent. My Mom's family is french Canadian, but it's been a while since I have talked to any of them. Lol. Hmm, I only recognize The Iron Witch. Guess I gotta wait for your reviews! I hate the feeling of some people thinking it is a bragging post only, it is not I am truly proud and want to share my love for a series or a stand alone book that people may not know about otherwise... 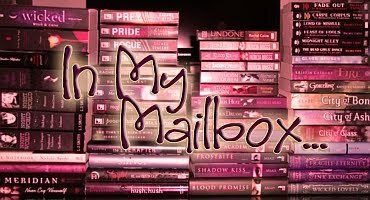 I found so many books in the last couple of years from the Wednesday WOW and the Saturday Wish List and the Sunday IMM posts that I will never catch up with the books I bought thanks to book bloggers!